Demand for energy around the world is rising, a fact that requires energy to be supplied in an environmentally friendly, efficient and safe way. Construction lots for building different types of power stations ranging from water to gas- and coal-fired power all the way to wind energy systems are as diverse as the forms of energy generation. Each structure places specific and frequently complex demands on formwork technology. In response Doka provides custom as well as holistic solutions and underscores its versatility with its in-house Competence Centre Power Plants. In the case of power station projects with a variety of construction lots, an all-encompassing logistics concept contributes significantly to a successful project progression. In the process, Doka develops holistic formwork concepts that include detailed utilisation plans through to 3D planning of complex construction lots and use of synergies between construction lots, thereby saving materials. “If Doka is hired for a particular construction lot, we will develop a custom formwork solution for each individual task”, Andreas Guttenbrunner explains. The Doka service portfolio includes all types of power stations, such as hydroelectric power plants and wind mills, gas-, oil- and coal-fired power stations or professional support in the implementation of power houses, turbine tables, stair towers, inlet and outlet structures, maintenance tunnels, chimneys, coal bunkers or caverns. 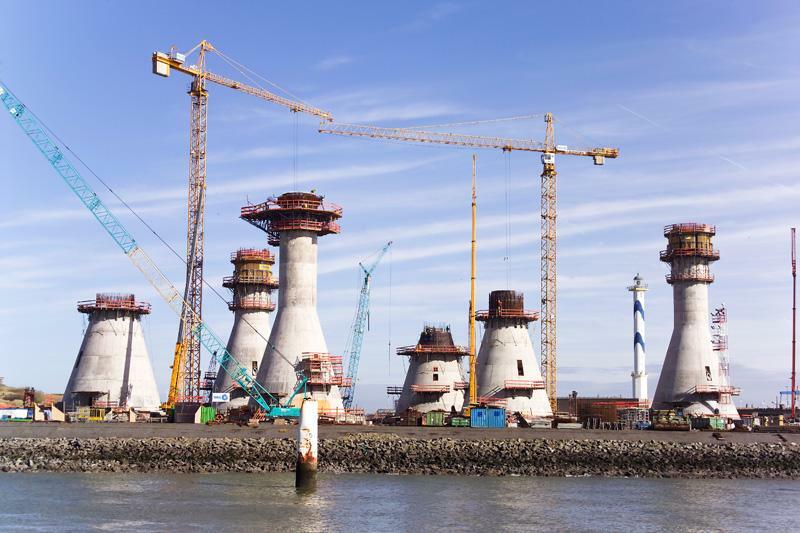 The history of Doka is closely connected to the construction of power stations. The name Doka has its origin in the supply of formwork components for the Austrian Donaukraftwerke (DOKW) in the 1950s. Decades of experience in international power station projects benefit Doka customers during realisation of their construction projects. Doka dam formwork has been tried and proven many times in dam or barrage construction for hydroelectric power stations. These formwork systems for mass concrete structures impress with their flexibility, high load capacity and workplace safety. The newly developed Dam formwork D35 with 350 kN anchoring tensile force makes it possible for the first time to form blocks that are 5 m high. 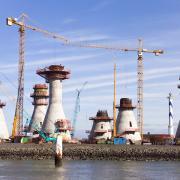 Doka systems are used for construction of foundations as well as for towers of wind mills. Flexibly adaptable formwork made of steel ensures that pouring sections of 4 m in height can be formed reliably and safely in a daily cycle. Storage structures, such as tanks and silos for oil- and gas-fired power stations (LNG tanks) are characterised by their complex construction site methodology. Pre-stressing and anchoring technology, platform widths and anchoring capacities pose particular challenges for formwork technology. 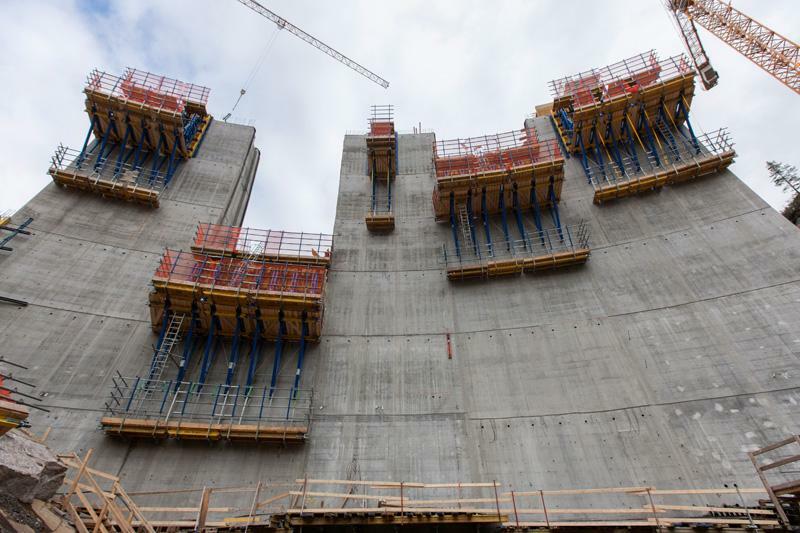 Crane-lifted Climbing formwork MF240 or 150F ensure systematic forming processes as well as rapid construction progress when building large-volume tanks, machine houses and stair towers. The system is easy to operate. 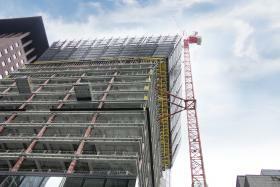 Formwork and climbing towers are quickly lifted by crane as one unit. 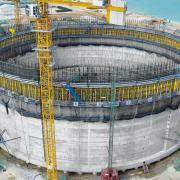 Apart from that, Doka offers additional systems for building tanks and silos, such as self-climbing and dam formwork. Safety is of utmost priority in all solutions. In the case of cooling tower projects for coal- or gas-fired power stations, the combination of detailed formwork and construction process planning as well as large-area formwork for clearly organised work flows ensure rapid construction progress. The Cooling-tower formwork SK175 is a fully mechanised, self-climbing system for pouring sections of 1.50 m in height. This solution allows for precise forming with extremely short cycling times. 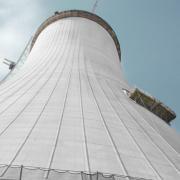 Doka offers additional systems for cooling tower construction, such as the Automatic climbing formwork SKE50 plus. Each project presents specific demands for formwork technology. They are handled efficiently and safely by Doka through the use of modular systems that allow for versatile utilisation. Thus, the experts also develop solutions for turbine tables, machinery and power houses as well as heavy slabs. This type of work requires use of the supporting construction frame for single-sided walls up to 12,8 m in height as well as powerful Doka shoring systems. Load-bearing towers Staxo 100 and Staxo 40 allow for excellent adaptation to different ground plans due to high load-bearing capacity and variable frame spacing. With more than 160 sales and logistics facilities in more than 70 countries, Doka quickly provides construction companies all over the world with the required formwork systems and a wide-ranging service portfolio. 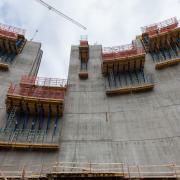 Doka customers benefit from local contacts and the expertise of an internationally leading formwork supplier. The Competence Centre Power Plants of Doka offers concentrated know-how gained from innumerable projects. The experts support Doka branches and customers all over the world in the event of complex project requirements. They ensure that experiences are integrated into new projects. In collaboration with the Research and Development Department, Doka uses knowledge gained from these power station projects to optimise existing systems and develop new products, services and safety concepts. In more than one way, the topic of safety plays a significant part in power station projects. On the one hand, the safety of the team on site is an important factor and an integral part of any Doka formwork concept. On the other, structural requirements such as sealing tightness, structural tolerances, concrete mixture and joint concepts pose high demands on formwork technology. Existing and new power station projects all over the world highlight the expertise of Doka in the energy sector. The Midlands Dam on Mauritius or Castrovido Dam in Spain are testimony to the skills Doka brings to the construction of hydroelectric power stations. During construction of a concrete arch dam, the “Dam Sarvsfossen” in Norway, the new Dam formwork D35 is used for the first time in 2013. There, a successful premiere is ensured by the standard system that includes pouring sections that are 5 m high as well as an integrated safety and logistics concept. 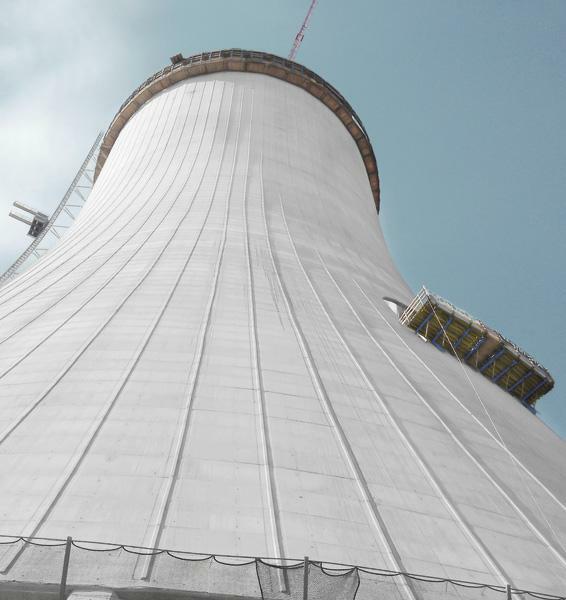 Doka provided a formwork solution based on the Cooling-tower formwork SK175 for the construction of the 164 m high cooling tower for the coal-fired power station Sostanj in Slovenia. 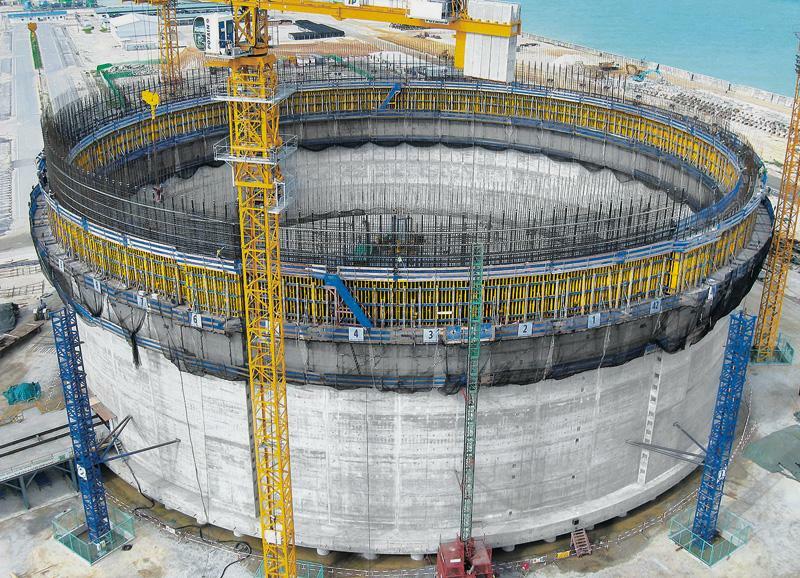 The LNG tank Map Ta Phut in Thailand with an 82 m diameter and 52 m height or the Civil Works-Ruwais GASCO Storage Tank in Abu Dhabi as well as the offshore wind farm Thornton Bank in Belgium are testimony to the wide variety of fields where Doka formwork systems are used. Doka also considers professional construction site support part of its efforts on behalf of the customer. For this reason, Doka Formwork Instructors provide support for the construction site team and ensure professional instructions for the construction site staff as well as professional assembly and handling of formwork systems. When all energies come together in one holistic formwork solution, nothing stands in the way of a successful construction project. Thank you for your interest - Formwork engineers to focus energy. Thank you very much for your interest - Formwork engineers to focus energy.